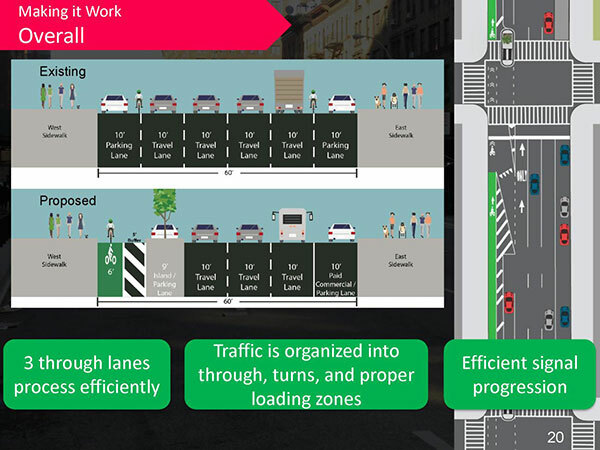 The New York City Department of Transportation (DOT) announced that it will to Manhattan Community Board 7’s Transportation Committee this evening a detailed plan to redesign Amsterdam Avenue on the Upper West Side. The first phase of the proposal includes a northbound parking protected bike lane from West 72nd Street to West 110th Street and pedestrian safety islands to improve crossing along the corridor. The proposal comes following requests from local elected officials and the community board to study the corridor for safety improvements and to provide a northbound pair for the southbound Columbus Avenue protected bike lane. Overall, the proposal will present a redesigned corridor that will be at a neighborhood scale, fit for the Upper West Side. From 4 p.m. to 7 p.m. on weekdays, approximately 16,000 yellow taxi trips start or end within the boundaries of Community Board 7. 50% of these yellow taxi trips are 1.5 miles or under, and 44% of the trips travel only within Community Board 7 boundaries. Yellow cabs account for 32% of the afternoon traffic volume on Amsterdam Avenue (about 400 per hour). Cycling is already growing in the Upper West Side; even without a protected bike lane, Amsterdam Avenue saw almost a three-fold increase of cyclists from 2007-2015. At the same time, Columbus Avenue cycling volume grew almost by half. Citi Bike expanded to the Upper West Side this year and plans to expand north to West 130th Street by the end of 2017. There is great potential for these taxi trips to shift to Citi bike rides, especially given the existing growth of cycling in the neighborhood. So far, data shows that these new stations are already popular for local trips as well as for trips travelling to/from the Upper West Side, demonstrating the need for this addition to the bicycle network. With the addition of a protected northbound bike route, the DOT expects that ridership volume will increase. From 2009-2013, this stretch of Amsterdam Avenue saw 36 severe injuries and two fatalities. The first phase if the project, which will calm traffic, includes a curb side protected bike lane, left turn lanes, pedestrian safety islands, and updated curbside regulations. The proposal will give pedestrians shorter and safer crossings. DOT is also proposing left turn lanes at West 79th, 86th and 96th Streets, along with split phase traffic signal, which give pedestrians a leading phase as they cross north/south, and cyclists a head start to continue north before cars turn left. Amsterdam Avenue is a busy commercial corridor and the DOT is also proposing to update curbside regulations to complement the bike lane. This will include paid commercial parking regulations on the east side of Amsterdam Avenue, from West 72nd Street to West 96th Street, between 7 a.m. to 7 p.m. on weekdays and at select locations on the west side. Doing so will maximize curb space for truck unloading and loading and reduce the likelihood of double parking during peak traffic times, processing traffic more efficiently. “The Department of Transportation’s proposal brings a complete street redesign to Amsterdam Avenue, including a proposed northbound protected bike lane. I am grateful to Commissioner Trottenberg and her team at DOT for their comprehensive response to the call for an Amsterdam Avenue redesign, and I look forward to hearing the input of the community at tonight’s community board meeting and in future conversations around the new plan,” said Council Member Helen Rosenthal. The proposal tonight for Amsterdam Avenue will primarily address the first phase of the project, between West 72nd Street and West 110th Street. 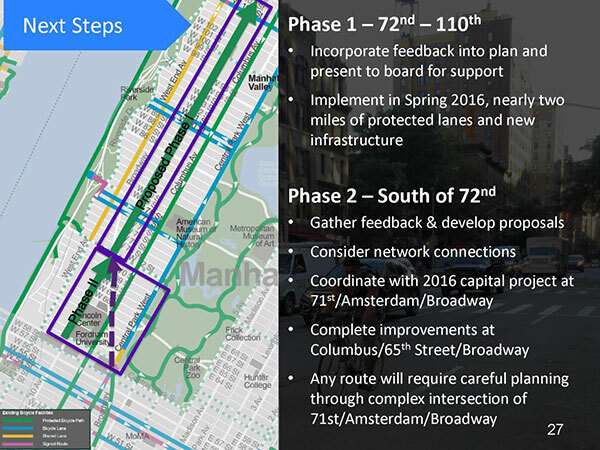 If there is an expeditious community process that supports the proposal on Amsterdam Avenue, DOT can begin implementation of Phase 1 of the project as early as Spring 2016. At the same time, DOT will continue to work with the local leaders and community to discuss bicycle connections south of 72nd Street for the second phase of the project.